The purpose of a photovoltaic (PV) solar panel, as shown in Figure 1, is to generate electricity. These solar panels are made up of a number of photovoltaic cells wired together to obtain a usable amount of current and voltage to provide power for your home. Photovoltaic science has been studied for more than 150 years, but it wasn’t commercialized until the mid 1950’s when the photovoltaic technology was used to power the radios on the Vanguard 1 satellite. In the early 1990’s many governments started to heavily promote the use of photovoltaic technology as a method to generate electricity for homes and buildings. Even now, there are numerous tax credits for solar technology. In fact, most types of personal tax prep software feature sections devoted solely to solar development. Note: A photovoltaic cell is an individual piece of crystal. 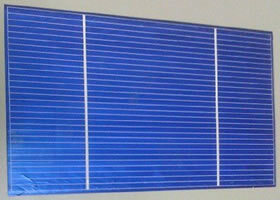 A photovoltaic panel is a number of photovoltaic cells connected together. 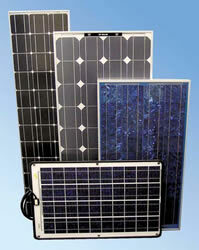 Today there are basically four types of photovoltaic solar panels. Single-Crystalline or as they are often called Monocrystalline solar panels are the earliest commercial type of solar panel, entering the market in the mid 1950’s. Solar panels made from single-crystalline technology are the most efficient based on the amount of electrical energy generated from a like area of panel. The monocrystalline technology is the most expensive of all of the solar panel types that are available. Figure 2 shows a single-crystalline photovoltaic solar cell. Degradation: 0.25% to 0.5% per year. Poly-crystalline PV solar cells, as shown in Figure 3, are different from single-crystalline PV solar cells in the method by which each individual crystal is created and their chemical make-up. 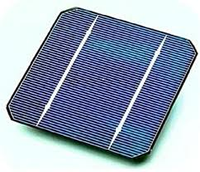 Poly-crystalline solar cells cost less to make than single-crystalline solar cells. The difference is in the efficiency of the two types of photovoltaic cells which is minor. 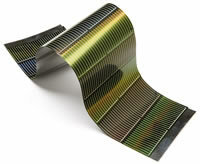 String ribbon photovoltaic solar cells, as shown in Figure 4, are a relatively new technology. This technology is much easier and hence less expensive to produce than either the single or poly-crystalline solar cells. However, the savings in manufacturing costs is offset by the much lower efficiencies of a single ribbon photovoltaic cell. 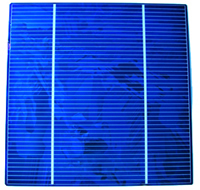 Thin-film solar panels are made by spraying a very thin coating of silicone over a base material. This technology is by far the most inexpensive method of manufacturing solar panels. The problem is that it is relatively very inefficient. The inefficiency becomes evident when calculating the area of solar panels required. Thin-film solar panels need twice as much area to produce the same amount of electricity as single-crystalline solar panels. However, if you have the space available, it is usually less expensive to install thin-film PV solar panels than it is to install half as many single-crystalline solar panels.